On May 11, 1935, by Executive Order of President Roosevelt, the Rural Electrification Administration (REA) was created. The REA paved the way for government financing of rural electrical power and revolutionized the life of the American farmer. Little local interest in Rural Electrification was generated until late in 1943 when a few concerned farmers and businessmen met in the B.F. Butler Law Office in Cambridge, Nebraska. An organization was discussed to borrow funds from the U.S. Government to build rural power lines in Frontier, Furnas, Gosper, Harlan, Phelps and Red Willow counties. This meeting brought forth the Twin Valleys Electrical Cooperative Association on January 31, 1944, which was quickly renamed Twin Valleys Electric Membership Association on April 29, 1944. 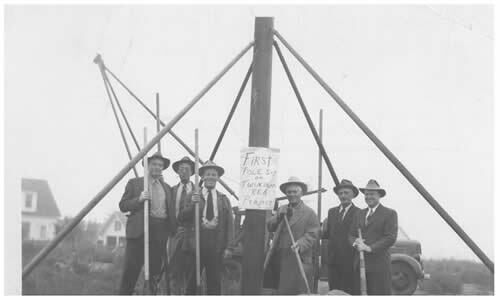 On October 31, 1951, the organization’s name was officially changed to Twin Valleys Public Power District, a political subdivision of the State of Nebraska, to alleviate a growing tax burden and make certain money was available for future financing. From the first office in the front of the Cambridge Locker Plant; the association moved to a building one block east. This building washed away in June of 1947 when the Medicine Creek flooded. All the records had to be re-written and the headquarters were moved to the basement of the Cambridge Museum. In 1949, a new office and warehouse were built on the west edge of Cambridge. Twin Valleys Public Power District resided there until moving into the present building (West Highway 6 and 34) in 1982. In 2000, Twin Valleys acquired the former NPPD building in Alma. This facility is presently occupied by both Twin Valleys Public Power District employees and NPPD employees. The year 2000 brought many changes to Twin Valleys Public Power District as we became part of the realignment with Nebraska Public Power District and started serving the villages of Republican City, Orleans, Stamford, Edison, Huntley, and Hendley along with several miles of transmission line. From the first pole over 70 years ago, Twin Valleys Public Power District has developed into 2,300 miles of energized distribution line serving about 6,644 meters and 198 miles of transmission lines. Twin Valleys Public Power District not only serves farmsteads, irrigation wells, stock pumps, feed lots, and grain storage facilities, but also schools, towns and oil wells. The District serves the villages of Danbury, Edison, Hendley, Holbrook, Huntley, Lebanon, Ragan, Republican City, Orleans, Stamford, and Wilsonville with retail power and sells wholesale power to the villages of Bartley and the City of Cambridge. Power is also delivered to the rest of the communities in the service area over the transmission lines maintained by the District. Currently, Twin Valleys Public Power District employs 23 employees to construct, maintain, and supervise the business of supplying our customers with electricity.